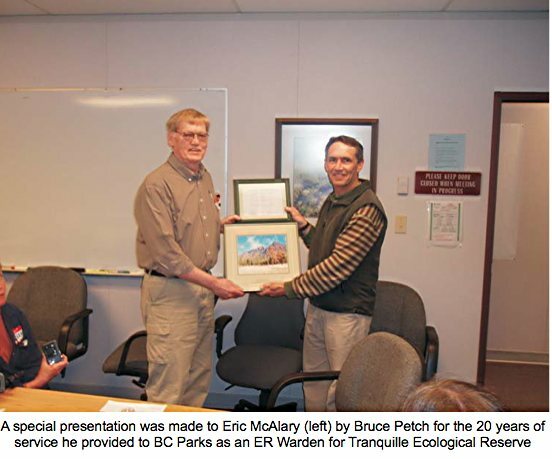 Eric McAlary was the volunteer warden for Tranquille Ecological Reserve for 20 years, from 1986 to 2006. I worked with Eric for the last 3 of those 20 years. Together we developed a simple but effective working relationship. During the winter Eric would draft a “management plan” (about 1/2 page long) listing the tasks he suggested be done in the coming year. This included things like fence repairs, sign replacement, plant inventory and perhaps ideas for small research projects. He would also specify what sort of help he needed from me. We would discuss the plan and come up with a final version. During the course of the field season, Eric would send me brief email reports when he visited the reserve. I accompanied him occasionally, and also let him know about anything going on that might affect the reserve. At the end of the season Eric would prepare a brief summary report on what had been done. Eric felt like he was part of the team, and I was very pleased to have a compe- tent and committed person taking care of one of the many parks that I was responsible for. Thanks, Eric, for a job well done!